This is the official home page. 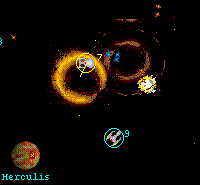 Netrek is a multi-player battle simulation with a Star Trek theme. As a player, you captain starships to engage enemy vessels, bomb armies and invade planets in order to expand your team's space empire. The ultimate goal is to genocide the enemy race, but the carnage of battles along the way is ruthlessly fast paced and a lot of fun! It's a team-oriented game with realtime dogfighting but involving a lot of ongoing strategy. It costs no money to play, there are no ads, and it's open source. Then, read Netrek in one paragraph or the full Newbie Guide and start playing. New Utility: Netrek Game On! There's a brand new utility for Netrek called "Netrek Game On!". It checks the metaservers and lets you know how many players are on line. It's in Java and should run on Windows, Linux, or Macintosh. Under Windows, you can iconize it to the task bar and keep an eye on when to play. Grab the latest version from the files section. Contact the Netrek Community! We've got mailing lists, web forums, an irc channel, and a Usenet newsgroup. Find out about Gatherings past and future, as well as ongoing game changes and development. In-depth guides covering almost any aspect of Netrek tactics and strategies. Good for newbies, intermediates and even very experienced players. Since its start Netrek has been developed as Open Source software. Netrek clients and source code are freely available in this download section. Nearly all common UNIX flavors including Mac OS X and Linux, as well as Windows are supported. Download your client and join the game! All about the different kinds of Netrek (Bronco, INL, Sturgeon, Hockey and more) and how the Metaservers show you what kind of games are happening and what machines they are happening on. Once you can play well, Clue Games are where it's at. Form a team with friends and challenge the world. Sometimes there is Netrek league play, where five or more teams form and play a season against each other. Currently there isn't much league action, but you never know when things will start up again. You can find stats and game recordings from past league play here, including the International Netrek League (INL), the World Netrek League (WNL), and the Draft League (DL), as well as links for others. What is Netrek? Learn more about the history of this addictive game with its Star Trek roots and what sets it apart from the rest of the pack. Want to code on the original team Internet game? We've got clients, we've got servers, we've got a network protocol with RSA client verification, all sitting in version control repositories and open source for your hacking pleasure. A little web page help and clue guide editing would be cool, too. There are a lot more Netrek resources out there on the World Wide Web. In this section we do a futile attempt to list the most prominent ones.